This is another of those, Euro crafts books that the publishers commit borderline fraud with the loose title translation and the infamous "depends on what your definition of is, is"! The original title was closer to working metal foil and wire than metal and wire. Since it was one of those bargain 90% off books it wasn't a total loss. It has some nice ideas that could be stretched in to fancy (real) metal framing and elements. For wall hangings, along with the basic wire worked as the old 70's sting and nail art stuff. It also has some basic working wire on the holed filled jig with the pins. And flattened wire jewelery pieces and bits. There are some drawings and work diagrams for the 30 projects. 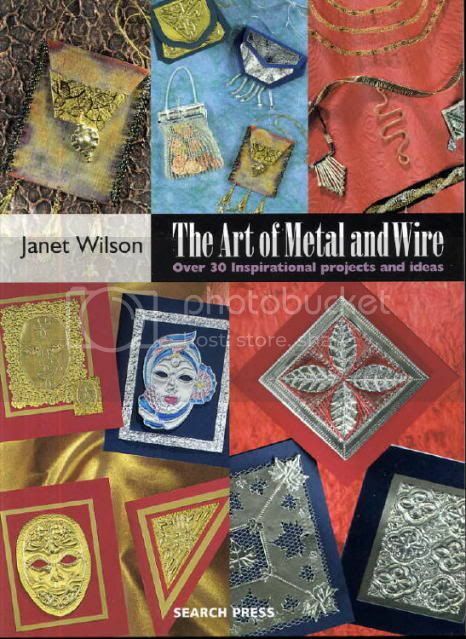 Most of which are greeting cards, purses and wall decorations from the metal foils, paper, paper clad metal foils, metal meshes that they are selling in the big box craft stores along with stickers. Some foil embossing,and punching and wire work. Not much related to do with the wording in the English version Title.